This is my husband and I's fifth Christmas together and every year we got a real Christmas tree. Two years ago, we went to the mountains and cut our own which was super fun! We wanted to do that again for this Christmas, but the closer we got to the day, the more we had going on and the more I started to lean towards just buying one local. I love the smell of a fresh tree so if we got a fake one, it wouldn't be plain green. I have seen a few flocked ones around and they were beautiful! I just didn't know anything about them, so I was a little nervous. If you haven't noticed by now, I'm super indecisive haha! Anyways, when the majority of you voted to get a flocked one vs a real one, a flocked was what we got...and I am beyond in love! :) If you want to see our real tree from last year, click HERE. We are seriously slightly obsessed with it haha! We literally just catch each other staring at it especially at night when the lights are on. 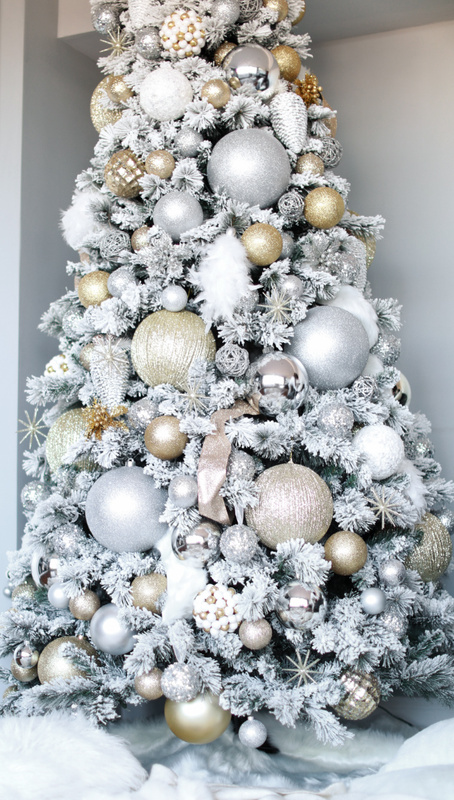 I am SO glad we went with this tree and so excited to finally reveal it to you all! Aside from being STUNNING, the best part of getting a fake tree was that it was prelit! It saved SOOO much time! Also, it made a bit of a mess when putting it together, but nothing like a real one. Someone mentioned that theirs irritated them and made them cough and I didn't realize it until we were almost done putting it together that I felt my nose itch a little. Nothing major, but the white can be a little dusty-like during set-up. Aside from the initial mess putting the tree parts together, there was very minimal mess when I put on the ornaments and it stays clean. No pine needles all over and I won't kill it in two weeks for forgetting to water it hahah! As you can see, I decked this baby out!! I had gold and silver ornaments from prior years, so I went with those again and added white and fur for a Winter Wonderland theme. I was so excited when I realized how much time we saved not having to put up lights but that sizzled quickly after two whole nights decorating it! I did some of the decorating the first night, but realized I needed more big ornaments and ended up getting more "wintery" ones to complete the theme. I spent WAY too much time on it. Because it is super sturdy, unlike a real tree, I was able to put a ton of ornaments on it without worrying about it flopping down. We watched The Holiday while decorating and I thought I would finish the tree by the time the movie ended, but then an hour passed, and then another, and then another, and then I finally finished it at 2 am and was so over it, I just wanted to throw it out of our apartment! By the next morning we made up and I haven't stopped staring at it since then haha! Hope you all enjoyed this post! I also loved all the Christmas trees you all shared with me! So fun & beautiful!